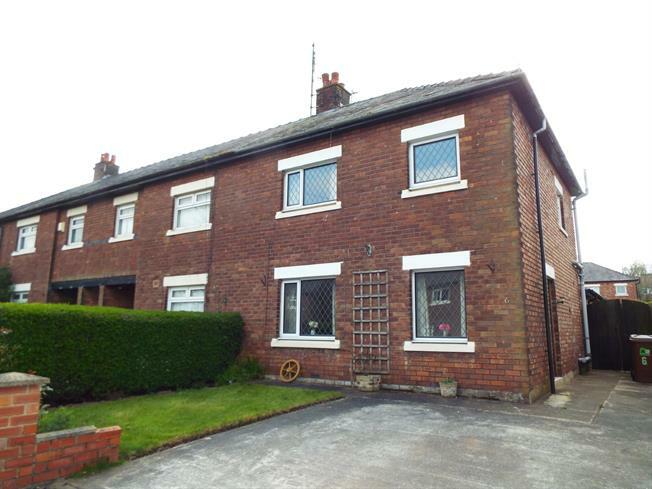 3 Bedroom Semi Detached House For Sale in Preston for Offers Over £130,000. Entrance Hall with under stairs storage cupboard. Stairs lead to the first floor accommodation. Generously sized Lounge/Dining Room with fire place housing gas fire. Built-in storage cupboard. Wall light point. Two double glazed windows to the front elevation. Extended Family Room with double glazed window to the side elevation. French doors open onto large rear garden. A range of wall and base units with complimentary work surfaces. Inset stainless steel single drainer sink unit. Gas cooker point. Space for fridge/freezer. Space for washing machine. Wall mounted gas boiler. Part tiled walls and vinyl floor. Double glazed window to the rear elevation. Step-in fully tiled shower cubicle housing electric shower, pedestal wash hand basin and low level WC. Part tiled walls. Shaver point. Double glazed window to the side elevation. Loft access point. Double glazed window to the side. Well proportioned master double bedroom with double glazed window to the front elevation. Well appointed second double bedroom with airing cupboard housing hot water cylinder. Double glazed window to the rear elevation. Good sized third bedroom with tilt and turn double glazed window to the front elevation. Three piece white bathroom suite consisting of enamel bath with electric shower, pedestal wash hand basin and low level WC. Part tiled walls. Double glazed window to the rear elevation.